I’ve been trying out a few new looks for the A/W 2011 season. What do you think? Ha, don’t worry, I don’t think it does anything for me either. Not a bad get up with Halloween on the horizon though, is it? Anyway, it’s not real, the chances of me succumbing to zombiefication are small, I’m well prepared! 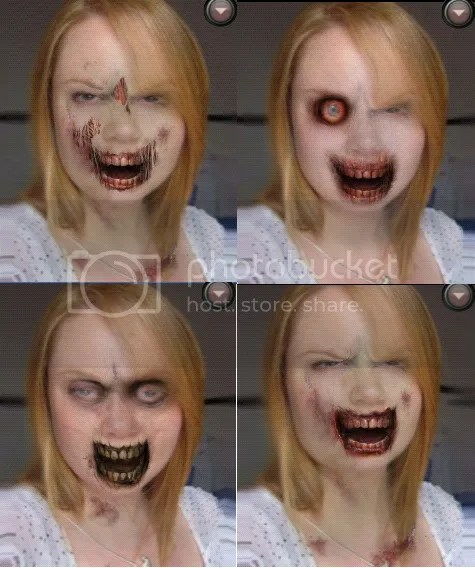 These four fetching looks were achieved with the magic of ZombieBooth , an app I downloaded for my Samsung Galaxy Pro. I think it says a lot about my personality that one of the first things I searched for on Android Market was ‘things to do with zombies’ (that’s ‘stuff pertaining to’, as opposed to ‘ways of entertaining’ the walking dead). This is one of the best I’ve found. And it’s not just still images either, the transformation is quite impressively animated and complemented with suitably creepy groaning. If you touch the screen your zombie will leap upon the opportunity to punish your lack of care and chomp on the offending digit, complete with blood splatters and squelchy noises. Awww, cute! And, speaking of cute, you can even zombify your pets. 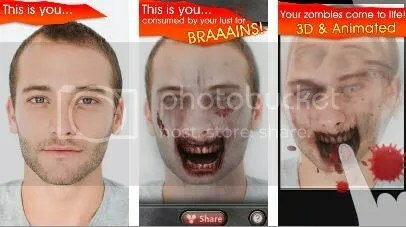 Though I actually find the results a lot more scary than ‘normal’ zombies. My cat already takes great delight in biting me for no apparent reason and seems to be plotting to kill me as it is (why else would he sleep on the stairs? ), so zombie kitties might be a step too far for me. See what I mean? This is a great app to have on your device, especially as we are now in the month of all things spooky. It’s incredibly easy to use, you can quickly snap photos of all your mates, store them on your phone and turn them into your army of undead before you can say “George A. Romero!”.